After cutting the pheasant up into portions, I cooked the pieces in butter and sunflower oil until just coloured. Removed the pieces from the pan and cooked an a chopped onion and four inches of a large leak until soft, adding about 50 grams of bacon pieces. 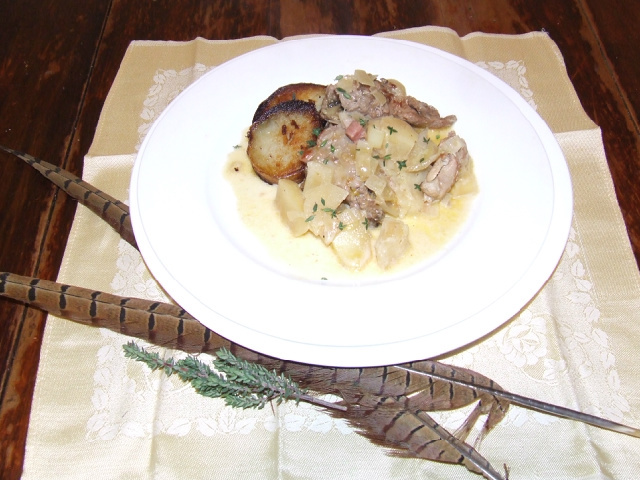 The pheasant was returned to the pan, then about 300mls of white wine (Sauvignon Blanc) was added. The lot was left to simmer quietly while I peeled and cut up a Granny Smith apple. I topped up the pan with boiling water to just cover the pheasant and left all to simmer until half of the liquid had reduced. 70mls of cream was stirred in, salt and pepper to taste and some thyme leaves. The temperature was turned down so the liquid was just slightly simmering for another half hour with a final adjustment to the salt and pepper. In the meantime I had boiled two potatoes, drained the water off and left to cool before frying them in butter and oil. P38 and veitnamcam like this. Thank you, Guys...the dogs got a share of the backbone and tidbits so we all had pheasant for tea!! Any apple MacBook gurus out there?